In my life, I had many fragrances. I dropped fragrances I loved but reminded of heartbreaks and (maybe) excessive nights out. I impulse bought. I re-purchased. I had “signature scents”. I was faithful, then promiscuous with my perfume choices. Good Girl, from Carolina Herrera is a delight. I mean, look at that killer stiletto bottle. Sensuous and dark. Admission: I wanted not to like this perfume as I wasn’t looking for a new one. However, as every good torrid love affair, I ended up falling head over heels. The strong base of toasted tonka beans, cacao, vanilla and coffee (the “bad” side) settle the sweet flowery tuberose, jasmine sambac and iris heart (the “good side”), which also contains some sandalwood and the top note is almond. As every woman, Good Girl is multifaceted. It’s strong and delicate. Explosive and elegant, playful but determined. I could go on forever, but you get it. I cannot say enough how vanilla, tonka, chocolate, jasmine and iris make the perfect scent for me, in any combo. Jasmine holds beautiful childhood memories of when my dad took me for walks in the evening and the jasmine flowers’ scent permeated the warm nights in Brazil. This concoction just hits the spot for me. Now… the strapline: “It’s so good to be bad“. I had ONE date with someone I spoke to an awful lot prior and after that date. We spoke a lot with hashtags (judge me, go on). #GoodToBeBad was “me”. Always followed by a comment “but it’s so good to be bad”. It makes me laugh, but in a way it kinda gives a bit of my personality away. As I am all heart-eyed emoji, I thought I’d get topical on National Fragrance Week (5-11 March) and express my love to my brand new squeeze! I got mine (50ml) from Indulge Beauty, but it is widely available from Boots, Superdrug, Debenhams… name it, you can find everywhere online and in-store from £49 (30ml) to £96 (80ml). Yes, I bought this one. It’s a labour of love. The clue is really in the name when it comes to feelunique – their personalisation services really are a fabulous special touch to make that gift – or that treat to yourself – truly unique. Now, I’m a sucker for personalisation: love a bit of Dani here, a little D here and a huge D there… you know, to feed my *slightly* narcissistic nature. Personalisation lures me in. Fact. Egocentric reasons aside, it can transform a simpler gift into something rather special for a loved one. Engraving can be done in glass and metal, so think perfume bottles and make up compacts customised specially for you or your loved ones. Swarovski crystal application is also a thing with the sparkly folks at feelunique: add you initials or a little star to a huge variety of products, including lipsticks! Personalisation costs an affordable £4.95 and can be either 1-3 Swarovski crystals depending on the product and up to 12 characters (in English) for engraving. The items that can be customised will be marked on the site. For engraving, you can just click on the + next to the word “Engraving” to add your text – you can read all on the feelunique website. A truly thoughtful gift that is convenient and needn’t cost the earth! Until a few years ago, I stuck to the same fragrance. It was my thing, my signature. Then, something happened. Maybe I started realising I was one and many a person… maybe I just got lured by the many scents on the market, bombarding my senses. Who knows? Enter scentaddict by the Fragrance Shop celebrates the need to change fragrances ever so often, with little guilt. In fact, it lets you “date” it for a while, before deciding if you want to commit. I don’t know about you, but usually the very base notes on fragrances are the one I do not like, do to know I really like a perfume, I need to wear it for a while, see how it develops on my skin and how it lasts throughout the day. With scentaddict you can do just that. For a monthly subscription of £12 you get 30 days (8ml) of your chosen fragrance, including luxurious, expensive ones, to try in a lovely refillable atomiser. To start with, you add up to 12 fragrances to your account and the first one will be with you in about 2 weeks. You can choose to receive the another fragrance you selected the following month or the same one. Should you really fall in love with a scent and decide that’s the one for you (you know, it an happen), you can redeem the£12 towards the cost of a full bottle. As it’s a subscription service you can pick a different scent every month until you find the one! It’s a really a discovery service and you can stop at any time. I got Scandal, a delicious John Paul Gaultier fragrance which has the most relatable pin-up legs up – if you cannot make up the relation to me, have a scroll through my Instagram. It might become apparent. The top notes are citric (blood orange and grapefruit), and I am not a citrus fragrance person. Having said that, the opening is rather sweet and crisp. However, it was the delicious heart of honey and gardenia that really hooked me in, offering a mellow, sweet smell finished with a strong patchouli base. It’s a world away from the classic JPG that is not quite my cup of tea. Plus, those heeled legs? I mean, what’s not to love? You can get all the info on scentaddict by the Fragrance Shop on their website, where you can subscribe and start flirting with a plethora of scents – there are more than 100 to try! Some say you mature into liking things you may not have liked when you were younger and with Chanel N°5 Eau de Parfum, I can confidently say this was the case. I first tried the iconic fragrance many years ago, and found its floral aldehyde bouquet of May rose and jasmine, bright citrus top and smooth touch of my favourite vanilla notes rather overpowering and far removed from becoming my scent. Fast forward a few years and I fell in love with it. And its story: back in 1921, Mlle. Chanel asked for “a woman’s perfume with a woman’s scent”, rare and powerful to be created. For the first time, aldehydes were use in a perfume and when picking the final product, Gabrielle chose the fifth sample of the fragrance, hence the simple name, N°5. The new fragrance was trapped inside a minimalist bottle, a revolutionary design at the time, with a clean white label and topped with a beautiful faceted cabochon. The current fuller version of N°5 eau de parfum is inspired by the original fragrance, re-interpreted by Jacques Polge in 1986. Obviously the perfume remains true to the brand and is a timeless classic. And now part of my scent signature. I still feel it is an evening fragrance and I love catching a whiff of it on my body from time to time throughout the night when wearing it. N°5 has been reworked many times, and it is now a family of fragrance, including the newest addition, L’Eau. Chanel N°5 Eau de Parfum spray costs £52 for 35ml, £74 for 50ml and £105 for 100ml. You can also get N°5 body lotion, deodorant and body cream, as well as a handy purse spray, which I’m telling you, is an imminent addition to my life! A scented love letter. That’s how the new Michael Bublé fragrance, By Invitation, is described. I must admit I was rather sceptical, as I usually am of celebrity fragrances, but will say outright: I was very pleasantly surprised. The bottle, a lovely glass circle suspended within a golden ring, with the top being a metal version of an atomiser, is just very elegant and looks amazing on the dressing table. However, I think if it was a real atomiser, it would give this perfume the luxury edge. Packaging is also clever in the sense it hasn’t got his name all over the bottle; only his initials on the inside of the metal ring. Classy. Bublé, a self confessed hopeless romantic, is through his perfume, inviting his female fans to experience “love in a bottle”, he says. That’s a huge claim Michael, but I have to say I can feel the lovable warmth of this floral oriental fragrance. It has top notes of red fruits and bergamot, while lily of the valley, wild jasmine and spicy inflections of peony are at its heart, on a base of sandalwood-musk and vanillas. For me, it hits the spot as a deep, elegant and sensual scent, the way I like my perfumes to be. It has the initial allure, it develops well on the skin and it does stick. Of course, Mr. Bublé is no perfumer and renowned French perfumier Karine Dubreil-Sereni is the expert behind it. Karine says that there were no restriction to use the finest ingredients to create this dream perfume of his imagination; how he would like a woman to smell. And the price, in my opinion is excellent for such a quality fragrance. By Invitation by Michael Bublé costs £55, £39 and £29 (100, 50 and 30ml respectively). There’s also a Luxury Body Lotion (£14, 150ml) and a Shower Gel (£12, 150ml). It can be purchased from michaelbubleperfume.com and from the 11 September you can get it from The Perfume Shop. 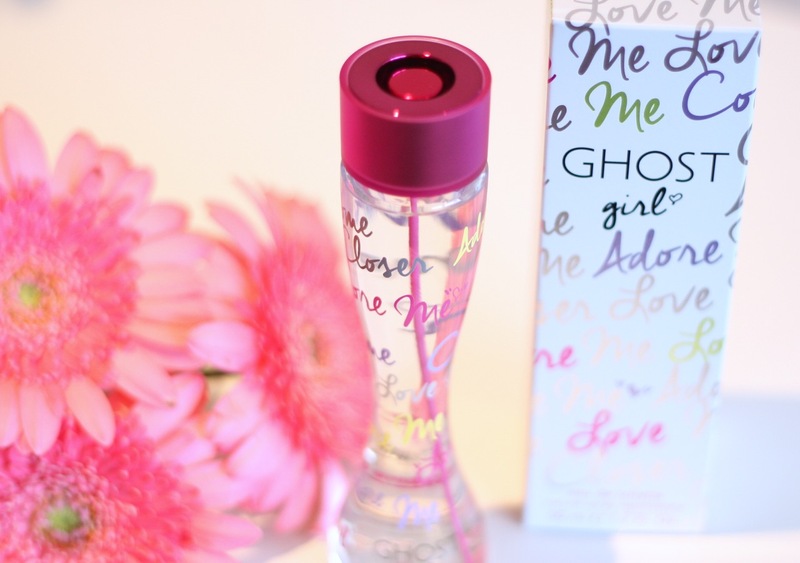 Not long ago I attended the fabulous launch of this feisty new fragrance fro Ghost: Ghost Girl. Starting with the packaging, it all scream girly fun. I love the colourful writing around it and the darker pink gives it an edge; this is feminine, but by no means sugary. Its opening notes contain pomegranate, pear, raspberry and bergamot; the middle are orange blossom, tuberose and almond blossom on a base of amber and cedar wood notes. It is fresh and not too sweet; it’s flowery-frutal, so very light and good for the summer. It develops and lasts quite well. It’s aimed at girls and women in their teens and twenties, and I do feel it is bang on the audience. It a young and fun scent, with a decent price tag. 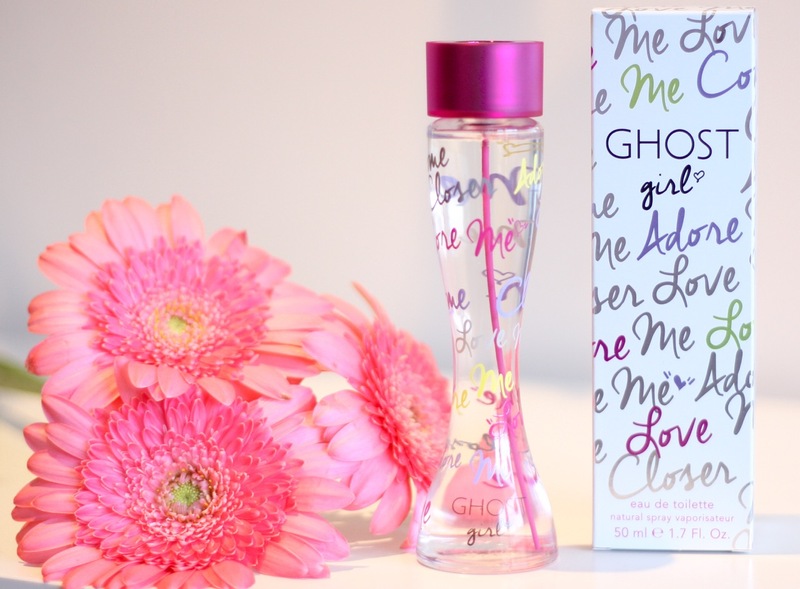 The contradictions between sweet florals and muskiness embodies the scent feisty spirit rather well. For my personal taste, at first instance, it lacks a little bit of depth and warmth; this is how I like my fragrances; I’ve never been a fresh, fruity perfume person. The opening and base notes I really like. Having said that, it is not something I would not wear. In fact, I’ve been using quite a lot, it is a reliable day scent and it grew on me to become my holiday pick for the beach! And that’s me having all the fun at the launch party! 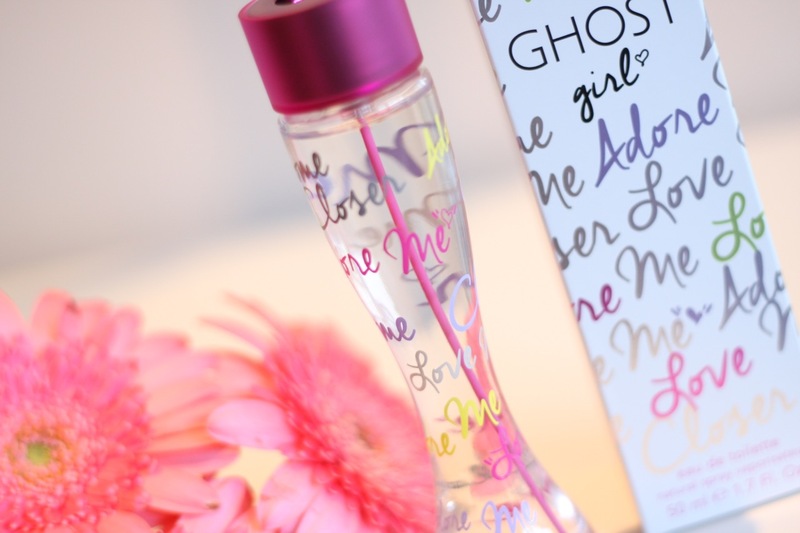 Ghost Girl is available in 30ml (£25), 50ml (£34) and 100ml (£46.50) and is available from retailers nationwide.